When you count on us, you can count on the best summer ever for your kids. One week or the whole summer. Indoors and out. Crafts to cannonballs, silly songs to science experiments at Summer Camp your kids will have an amazing experience, all in a safe, inclusive and nurturing environment. Our YMCA is committed to Character Development. It is infused into YMCA programs locally and all across the country. The four core values of Character Development are honesty, caring, respect, and responsibility. We believe that shared values hold families and communities together. At YMCA Summer Camp, we incorporate these values in our daily activities. 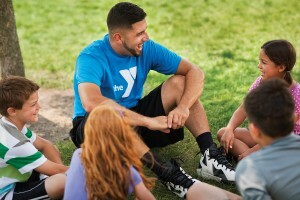 The Kishwaukee Family YMCA is a charitable association whose mission is to promote Christian principles through quality services and facilities. We strive to enrich the Spirit, Mind and Body of all of our participants, especially families and children, regardless of ability to pay. We strive to enrich the Spirit, Mind, and Body of all our participants. In the camp program, we use character development, crafts, active and non-active games, along with a variety of other activities to build strong children both physically and mentally. Strong children are just one piece of the YMCA’s goal of strong children, families, and communities. At camp, we believe that by building strong children we are also helping build stronger families and communities. • Deliver the program in a positive YMCA environment of safety, support, and care. • Assure that children HAVE FUN! 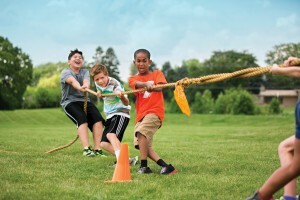 You can depend on the Y to make sure that all camp activity areas are well supervised. Camp staff are interviewed and background checked prior to being hired. As role models, they are selected for sound judgment, maturity, experience, enthusiasm and creativity. Training occurs before and throughout the summer to ensure attention to detail. All staff are certified in CPR and First Aid. A deposit of $10/week will be due at the time of registration. *A nominal Summer Youth Membership Fee for non-members of $50 or choose to upgrade to a Summer Family Membership and pay $99. The summer membership will be valid June 1-August 31st. Non-members must register at the YMCA Front Desk. Online registration is only available for YMCA Members. If registering at the YMCA Front Desk, all forms must be turned in at the time of registration. If registering online, please be sure to turn in forms to the YMCA as soon as possible. All forms must be turned in prior to May 14, 2019. A healthy, USDA approved, lunch and afternoon snack (including field trip days) will be provided, FREE of charge from Voluntary Action Center (VAC) and the Y. A monthly menu will be posted for parents. If an alternative lunch is preferred parents are welcome to pack a nut free lunch and/or snack for their children. Please leave soda and candy at home. All electronics, cell phones, toys, soda, candy, money, sandals & flip flops unless specified by the day’s events. Financial Assistance for YMCA Summer Camp is available thanks to donations to our YMCA Annual Campaign and the Kishwaukee United Way. The application for financial assistance for summer day camp is below. Information for scholarships will be available 3/1/19. Please note the deadline for applying for financial assistance is 4/1/19 for this summer. Parents are responsible for completing the 4C application and receiving an approval letter with the Kishwaukee Family YMCA listed as a provider prior to the start of Summer Camp. Parent co-pays must be made through an automatic draft on the first of the month. Parents are responsible for any camp fees not covered by 4C. Summer Camp is fun for the little ones! Children participate in hands-on learning experiences along with all the fun of camp! Activities include arts & crafts, games, songs, music, and nature. A $5 deposit for the each MWF & TH session will be due at the time of registration along with the $25 registration fee. *A nominal Summer Youth Membership Fee for non-members of $50 or choose to upgrade to a Summer Family Membership and pay $99. The summer membership will be valid June 1-August 31st. Non-members must register at the YMCA Front Desk. Online registration for summer camp is only available for YMCA Members.